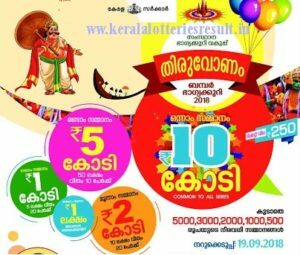 Thiruvonam Bumper 2016 Lottery (BR-51) is one of the popular bumper lottery conducted by Kerala Government lotteries department. Kerala State Thiruvonam Bumper Lottery 2016 ticket sales has been started on 20th July, 2016. Kerala Lottery Thiruvonam Bumper 2016 Lottery (BR 51) 1st prize will be Rs 8 Crores and the 2nd prize will be Rs 50 Lakhs, 3rd prize Rs 10,00,000/-. The complete prize structure of Thiruvonam bumper lottery listed in below table.